HOUSTON, Texas, February 21, 2013 (ENS) – An oil spill into the Gulf of Mexico was averted by the quick action of crew members aboard one of two inbound chemical tankers that collided on Wednesday, approximately 70 miles south of Galveston, Texas. The early morning collision caused some internal damage to one of the tankers. Watchstanders at U.S. Coast Guard Sector Houston/Galveston were notified of the collision by a National Response Center report at 4:30 am. The report stated that the Chem Sea, a 385-foot tanker, and the larger Bow Kiso, a 557-foot tanker, had collided while headed for the Houston Ship Channel. The Panama-flagged Bow Kiso suffered a fuel leak in their engine room, but the crew was able to patch the leak and pump the remainder of the fuel into an auxiliary tank. 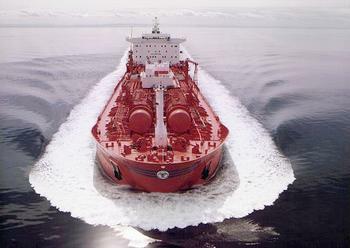 The double-hulled Bow Kiso is owned by Chemical Clipper Transports S.A., a subsidiary of Odfjell Tankers AS of Bergen, Norway, one of an Odfjell fleet of about 100 chemical tankers. The Coast Guard launched crews aboard an HU-25 Falcon jet from Air Station Corpus Christi and an Air Station Houston MH-65 Dolphin helicopter to assess the situation. Personnel from the Coast Guard Marine Safety Unit Texas City will board both vessels to conduct damage assessments and investigate the cause of the collision.